We hear that so much! I didn’t want to believe it myself until I got married and realized how hard it really was. At that point, the common phrase that marriage is hard work was actually comforting and validating. I still didn’t like how hard it was, but at least I wasn’t alone in the struggle. 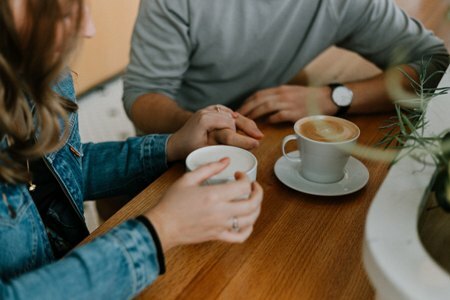 My husband and I followed all of the typical steps suggested to fix things in our marriage, such as going to a therapist, and even attending a retreat. We gained some help with these efforts, but nothing we did was able to change our frequent fighting over money, connection, and sleep training. I am so grateful to have come across Laura Doyle’s book, The Empowered Wife and her 6 intimacy skills. When I received coaching on these 6 intimacy skills and then became a coach in them myself, our entire marriage was transformed. BH, we are far from perfect, and I’m still growing and working on myself every day, but I can say that our marriage is truly filled with peace, love, and joy—a huge difference from our previous wars every few days and our nightly fights. It is clear to me that I am on a mission from Hashem, and I am deeply passionate about that mission—to be a vessel to transform others’ marriages in the same way ours was transformed. If I could use one word to sum up how peace has become the basis of our marriage, it would be “emuna”. I used to harp on my husband for all of his “wrong choices” in every area of life. I felt like I was the know-it-all, grounded, emotionally intelligent one who wanted to take the Torah’s phrasing that it’s a woman’s job to build her husband very literally. I looked with my judgmental eyes at all of his faults, and felt it was my main role in life to help him become better—basically, more like me. I looked down at his desire to run his own business, and I also judged his way of showing love. I felt that it was my job to tell him to get a 9-5 job with benefits to support a growing family, as I just assumed he was clueless and didn’t know better. I felt it was my duty to teach him how to verbalize emotions vulnerably, since this wasn’t something he naturally did. Looking back now, I can see that each “helpful” suggestion was perceived as a criticism of who he was as a person. Each suggestion made him pull away from me more and more. My words also led to fights when my husband wanted to take a different path than my (obviously) correct ideas. We had fights on top of fights, and it was all just getting bad. The training I received through Laura Doyle’s relationship coaching program showed me that my helpful suggestions were in fact critical and disrespectful. I learned how to let go of managing my husband’s life, and to trust that his business ideas and ways of loving me were just right. He was being himself, and I was trying to mold and change him. Letting go and trusting him have been the biggest ways I have been able to “build” my husband, as he now has the space and spousal support to grow himself. I have discovered supporting him is the key ingredient in helping him become all he is meant to be. Once I let go and trusted, my husband began to work for himself, and he is succeeding in ways that are fulfilling to him and profitable for our family. Once I let go and trusted my husband to give me love in the way he chooses, he started showing more and more love, and he has now begun to express himself in all of the ways I had previously tried to force out of him. I feel tremendous inner peace now that I have let go and been able focus on me and my goals, which are to be a good wife, mom, and Jew, and to inspire people on my mission to transform marriages. But there was still a missing piece. Our fights about how I wanted him to change had stopped, but I was still irritable on a daily basis. I tried to use more self-care, get more sleep, and take more alone time—all of which helped, but didn’t kick my irritability streak. So, I received coaching in this area too, and I learned that I was now turning all of my controlling tendencies right back toward myself. I was now pressuring myself to find parenting solutions, just as I had previously pressured my husband to find a 9-5 job. I was forcing myself to become an expert cook, just as I had been demanding that my husband open up and become more expressive with his emotions. I was putting tremendous pressure on myself to figure out all aspects of my life right now, and it was causing me to become snappy when one too many things would go wrong. I have since learned to let go internally, as well. Now, I do my best to experience and feel the stresses of life as they come, so I don’t suppress and internalize the emotions too much. Then, once I have felt the struggle in whatever form it comes, I consciously let it go and trust that I am doing my best. I have stopped putting so much pressure on myself to figure it all out immediately. This has been my own inner key to returning to my non-irritable self. Of course, I still have lots of work to do, but I have felt a huge internal shift since I have let go. So, I check in with myself all day and see if I’m piling on stress and holding onto it internally, and if I see my body clenched with the stresses of the day, I relax inwardly and let it go. This gives me more breathing room to experience stressors and react from a joyful, balanced state—and ultimately, be a more loving wife and mom. We are in this world to get to know Hashem. All of our daily interactions and experiences are to show us who Hashem is. My experiences of letting go of control over both my husband and myself have been profoundly valuable as I grow in my emuna in Hashem. I have learned to let go and trust, and now the work can be transferred to the bigger picture of all that is, our Almighty Father and the peace we can feel when we truly trust Him. May you all be blessed to live with emuna in yourself, in those around you and in Hashem. What do you hear that is true for you in all of this? Where are you attempting to control your spouse or yourself, and how can you let go? I invite a real and true trusting and letting go—and I am here to support you on your journey! is a Laura Doyle relationship coach. She is passionately confident that her coaching has the power to transform even the most challenging marriage struggles, with Hashem’s help. She believes that each marriage can be filled with peace, love and joy. Rachel commits to coaching from an authentic place, only sharing what has worked in her own marriage. Click here to check out Rachel’s story and apply for a complimentary discovery call to explore coaching. Click here to enter your name and email to receive updates regarding marriage talks and workshops.